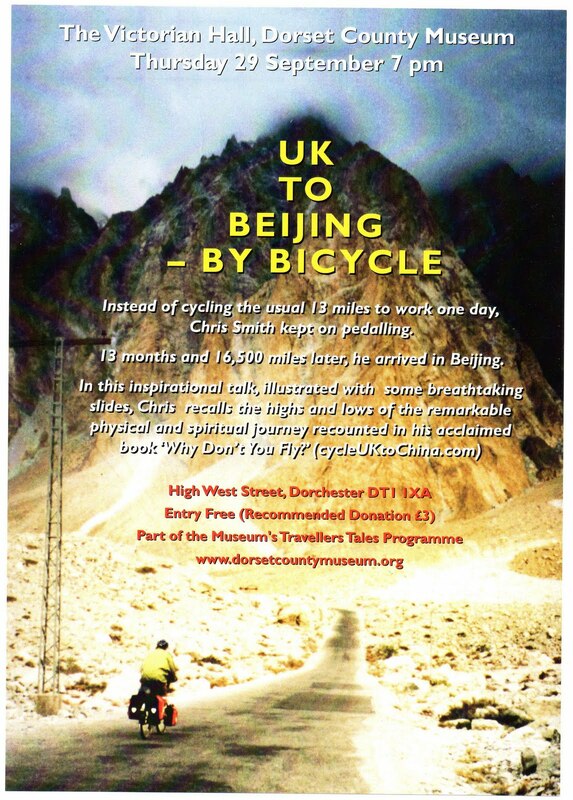 This month I'll be in Dorset to speak about the 16,500-mile bicycle ride from Worcestershire to Beijing, accompanying the talk with a selection of spectacular slides and following it with a book signing. 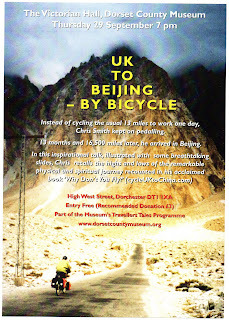 ‘Why don’t you fly?’ a bemused friend asked me when I stated my intention to cycle across the planet. For thirteen months my lungs and legs were to power me into headwinds, across deserts and up to mountain passes (and a wonderfully indomitable, reliable and adaptable source of power they proved to be). How does it feel to trade domestic comfort and security for life as a nomad and to pare one’s life down to the bare necessities? What is it like to push at the frontiers of one’s physical and mental endurance? What is the effect upon the human spirit of struggling against hurricanes in the Gobi Desert by day and shivering alone in culverts at night? How does the agnostic westerner react to the religious fatalism of Islam and Hinduism in encounters with locals? As well as attempting to answer these questions, I speak about the importance of having a dream, about connecting with one’s passions, about recognising and seizing opportunities – and about how I wore out three sets of tyres, three chains, two pairs of boots, and fell off the bike six times. The gruelling journey served to demonstrate that the human body is a powerful, flexible and immensely sophisticated engine that thrives on hard work. 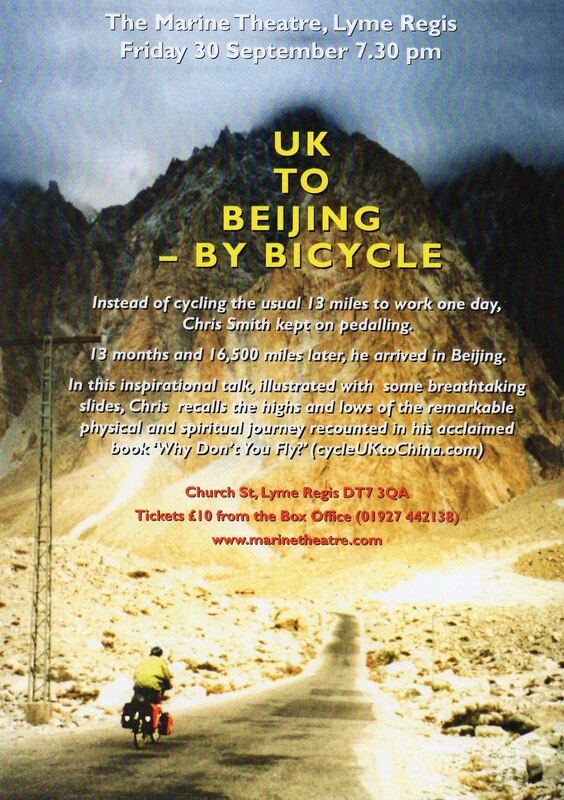 Since my return from Asia in September 2001, I have more than trebled the 16,500 miles I covered during the epic ride by cycling between 125 and 150 miles a week to and from work in all weather conditions. ‘Why don’t you drive?’ ask my incredulous colleagues. The power of the ‘human engine’ continues to be underestimated by those who prefer to rely on the internal combustion engine to the detriment of their health and the environment. For more details about journey, author and book, please visit www.cycleuktochina.com. The website includes a sample chapter of my acclaimed book ‘Why Don’t You Fly?’ and over 90 photographs. As none of the slides I show during presentations are displayed on the website there is no need to worry that prior visits to it will reduce the impact of the presentation. Thank you for coming into school last week for ‘World Book Day’. The assembly, and talks you gave, were an inspiration to all who heard them, and I look forward to reading your book over the Easter Holiday . You came to school to talk to our Lower Sixth girls last summer, and I wonder if you would like to do the same again this year? The feedback on your talk was extremely good. Thank you for the very enjoyable, witty and informative lecture you treated us to last week. I need hardly say we were all completely in awe of your epic adventure and comments ranged from 'truly inspirational', 'very courageous', 'unbelievable' and 'brave' to 'foolhardy' and 'crazy'! I am currently reading your book and I am halfway through India so still have much excitement and many surprises to come. I wish you the best of luck for the future and at least you will always have the satisfaction of saying that you achieved your dream while the rest of us just thought about it! Thank you once again. A quick note to say thank you for your presentation to MCCC at Ashwood Marina on Tuesday evening. I hope you enjoyed talking to us as much as we all enjoyed hearing about your epic bike ride. As Bob Morgan said in his introduction, you are no mere mortal and your story about your trip was truly inspirational. I really enjoyed the additional touches of very detailed maps and an inspirational maxim accompanying each stunning photograph of your journey to Beijing . We met when you gave us Droitwich Probus '97) your ‘ UK to Beijing ’ talk. I am just coming to the end of your marvellous book, which is so much more than a travel book. I have enjoyed it so much – you have so much to say about the countries that you cycled through and the people that you met. My very best regards, and thank you again for giving ME an ‘Incredible Journey’. What a great feat of endurance your ride was. You have been an inspiration to myself and many others. Not that you will remember but I was the chap at Crewe library who asked how it was you were able to photogragh yourself on the front cover of the book. You have been an example to us all of what can be achieved. Brilliant. Chris Smith seems to be a man of considerable talent. 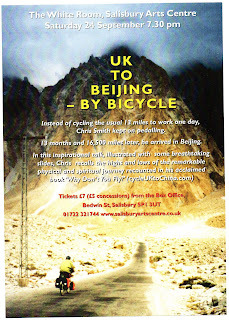 I lived every mile of his journey to Beijing , which included a four-month side trip around India . By the end I felt that I’d done the trip with him and enjoyed every inch. Buy this book! It’s a great read. Every child interested in geography should have the availability to read this book, as much for its excellent descriptive English as the content. Just to say how much I liked your talk at Eastbourne Under Ground Theatre and loved your book. All the best with whatever you decide to do next.